This accessory features the amazing rendered 3d maps produced by Ø1 Games. The maps come with 1 inch square grid. 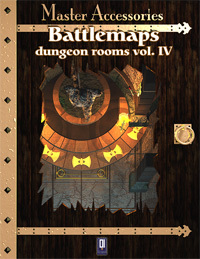 Dungeon Rooms Volume IV enhances the features of Dungeon Rooms Vol.I, Dungeon Rooms Vol.II and Dungeon Rooms Vol.III. 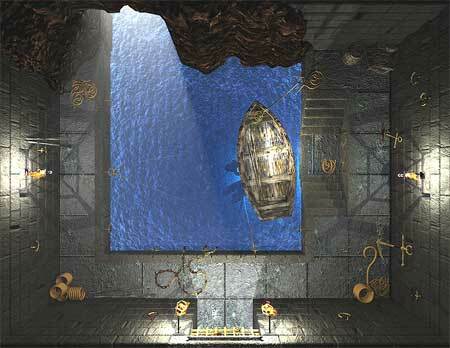 These rooms are even better than the previous: state-of-the-art map for your gaming pleasure. You will find, of each map, three versions: full color, grayscale (optimized for B&W printing) and line art. In Dungeon Rooms Volume IV you will find more dungeon rooms to build your custom dungeon complex, including the Mines Entrance, the Dwarf God Temple, the Underground Dock and more. 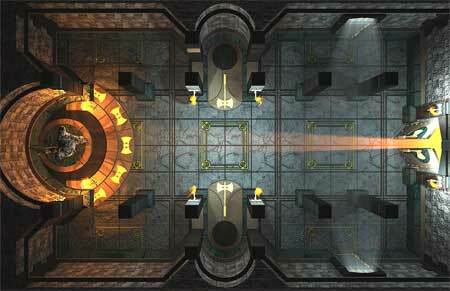 Each map shows a dungeon room from a top-down perspective with stunning lighting effects and superb 3D-rendered objects. You can easily print out these maps and place your favorite miniatures on them. Highly detailed, these maps add flavor and facilitate tactical movements while running combat encounters. A one-inch square grid is drawn on each map but blended in perfectly with the environment. Each map is printable on a single sheet of paper, except for one map (the Altar of the Spider God) that comes divided in two sheets. You can print out the map you need in full color, or choose its grayscale-optimized version if you do not want to consume too much ink. Now you can even print it in line art which allow you to save more ink. Even if you decide to print them in color, these battlemaps will be always more cost-effective than a printed version, as you can print out just what you need... even multiples of your favorite ones. These maps are so detailed that simply looking at them can give thousand of ideas for your own games. Why does a blade of red light filters through the Gemstone room’s door? Who was the rotten skeleton in the King’s Crypt, or what kind of magic keeps the tree in the Magic Tree room alive? You know the answer, and your players will soon discover it. You can assemble a dungeon using the battlemaps, connecting them with dark hallways and dangerous corridors and finally fill them with hideous critters of your choice. 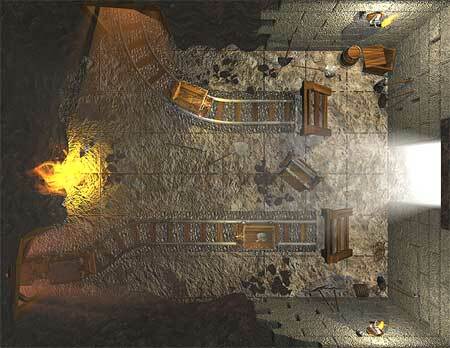 The players will enjoy the battle in your custom built dungeon. More of these supplements are planned, and in no time you will be able to build any dungeon you desire.